So far we've discussed past voting trends. And popes. And misguided attempts at fame through cartographic systems that flip statisticians the bird. But most relevantly the trends thing. Unfortunately the past can only tell us so much about the future; trust me, I'm an archaeologist. This week we look at margins and swings, the apparently ubiquitous means of determining how safe – or not – a seat is. There is nothing wrong with this methodology, assuming it is used only when appropriate and that its shortcomings are understood. All too often this is not the case. Any truly marginal seat is marginal because it could go either way. It is, by nature, unpredictable. However there is no hard-line between safe and precarious. All seats exist on a continuum of knife-edgedness, some more knife-edgey than others. While looking at past trends is one way to measure this, margins use the percentage of the vote that gives the current incumbent an edge over the other candidates last election (or by-election). For example, a seat with a margin of 6% means the incumbent has 6% more of the votership's support than her (or his) nearest rival. In our system, candidates are slowly eliminated until there are only two left, so this is the same as a 47-53 split of the votes. 6% is actually not too shabby. By the standard measures in Australia anything less than 6% is “marginal” and anything up to (but not including) 10% is “fairly safe”. “Safe” covers 10% onwards and 20% upwards is “very safe”. So 6% is fairly safe, but only marginally fairly safe. In the early years some MPs were elected unopposed, which is technically a 100% margin and “very safe”, although it obviously says nothing meaningful about the outcomes if someone else were to run next time. The idea behind this approach to knife-edgeiness is that certain demographics vote in certain ways. Urban seats typically hold more left-wing voters while rural seats generally lean to the right. As such, certain areas will have a base of dedicated voters who – short of a major scandal or other significant event – hold a strong allegiance to one party (or at least to one set of ideals) and will consistently vote accordingly, immune to all the campaigning. Some seats will have a small number of such voters, others will have many, possibly even being dominated by them. In some seats these “rusted on” supporters will be split rather evenly between parties, negating each other, and in others they will present as a significant head-start for one party or another. To pick an example, a rural seat with a large block of firm right-wing voters will give more right-wing candidates a head start. If the general result of the campaign leads to the remaining “swinging” voters mostly voting right then the margin should be pretty substantial. If the campaign leans the other way the seat will be less safe for the right party or possibly even a marginal left seat. The margin will be small, though, and the predictable swing back will see the seat return to its former position. In other words, a seat with a lot of campaign-proof, right-wing voters will normally lie between being strong right-wing and weak left-wing seats over the years. This becomes particularly relevant at the following election. If the seat is “safe” (i.e. its margin exceeds 10%), we can predict the seat is unlikely to change since the swing away from the incumbent would have to be equally substantial. (If an election leads to more people voting for a party than last time, there is said to be a swing to that party. This swing is measured again as a percentage of the voters, and can be measured for the nation as a whole or on a seat-by-seat basis.) In the above example a swing to the left would mean a marginal right seat becomes more marginal, possibly changing hands, or a marginal left seat becomes safer for the left-wing party. It would also make a dent in a safe right seat, but swings of over 10% are rare, so it would most likely remain as is. 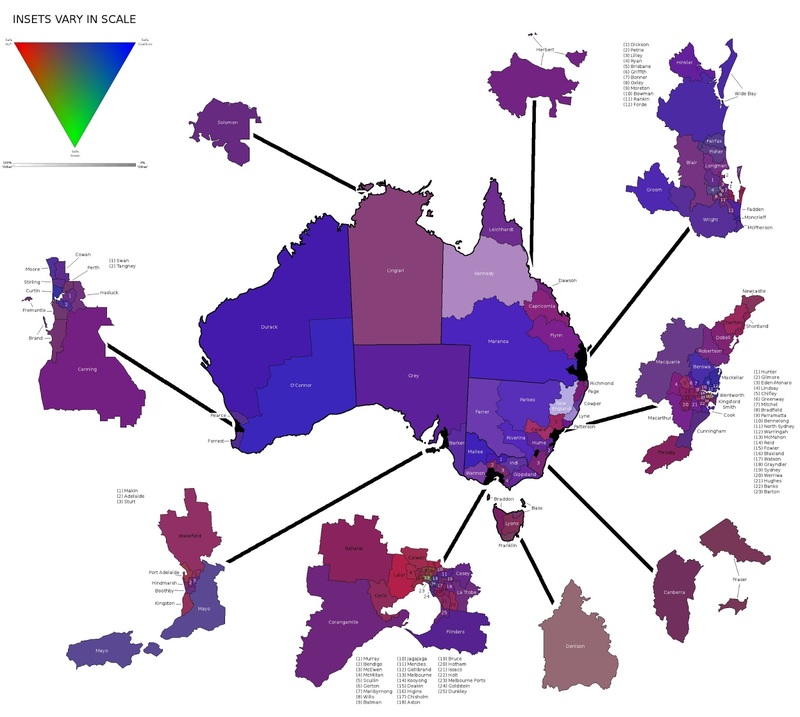 Data from http://blogs.abc.net.au/antonygreen/2013/01/2013-federal-election-pendulum.html. Thanks Antony. The map above gives each seat a colour whose paleness is determined by its margin. The lighter the seat, the more marginal it is. And, as per tradition, red is Labor, blue is Coalition, green is Green and grey is the bottom drawer where we put everything else. This is the normal way of assessing how safe a seat is. It assumes, however, that all seats are equally volatile. In reality, a seat that consistently supports a party with a margin of 5% is less tenuous than a seat that currently supports them by 8% but regularly has swings of 10% or more. The only way to judge seat volatility is through past voting trends, which I have previously discussed. Ideally a combination of trends and margins would be used (as I proposed in a previous conclusion here) however no-one seems to do this, and I cannot find the necessary data. Perhaps no one has done this because the data is so hard to obtain (though I strongly expect professional psephologists should be able to get their hands on it from some archive somewhere), or perhaps the data is so hard to obtain because no one bothers to do this kind of analysis. 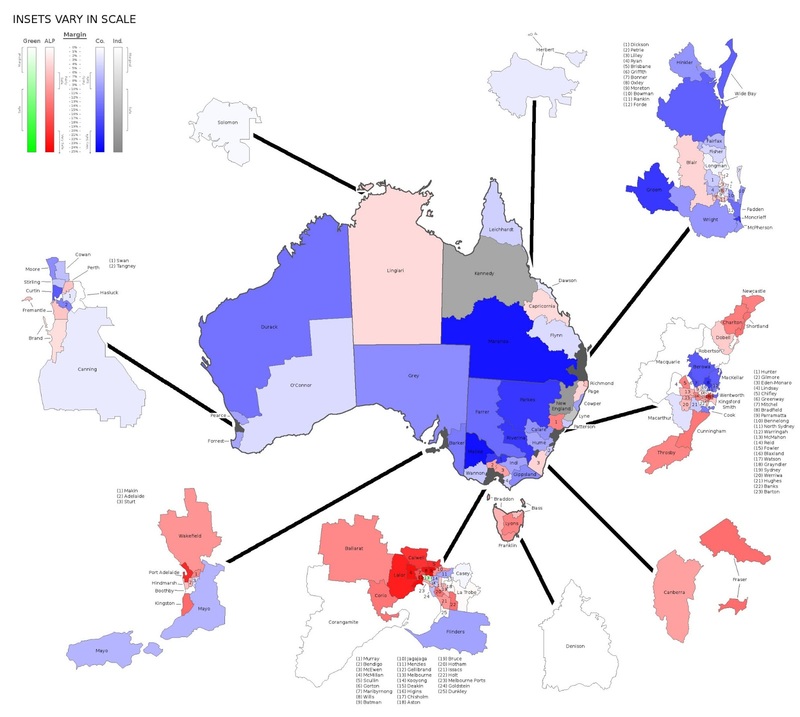 Another error with this two-party preferred approach is that its focus is purely on the incumbent, and suggest all marginal seats are within reach of any party – or at least any major party – yet a marginal Coalition seat is not necessarily within the grasp of the ALP (and vice versa). The seat of O'Connor, for example, is marginal. It's margin is only 3.6 for the National party. However, that is a 3.6% lead over the Liberals. The ALP and other parties do not come close, so although the Nationals hold the seat by less than 4%, it is still a very safe Coalition seat. This map assigns colour based on the proportion of the vote won by each party-group. Because I am not a huge fan of the two-party mentality, I've tried to represent the nightmare that is the multi-party division of votes. Here, red, blue and green are as before, but Independents and other minor parties are represented by white. The more red a seat has, the more people there voted ALP. More blue means more Coalition voters. Higher green values relate to stronger support for the Greens. The most marginal seats will sit somewhere between these extremes, ranging from purple to yellow to aqua. Paler seats have a larger proportion of votes going to the 'others'. If we ramp up the contrast as a rough rule of thumb, we see most seats turn either red or blue. Some with a higher Greens vote – mostly east-coast, inner metropolitan seats – turn black. The mainland independents' seats become white due to the high 'others' votes. 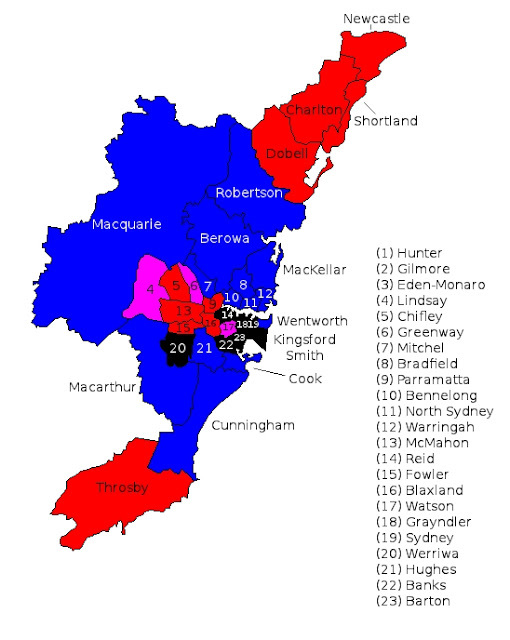 But of particular interest are three inner-metropolitan seats near Sydney (Lindsey, Greenway and Watson) which are magenta. This indicates that the Labor-Coalition primary vote split is extremely close here. Lindsey and Greenway are among the numerous marginal seats of map 1, but Watson has a 9.1% margin – the safer end of the 'fairly safe' range. In fact, the primaries are split only by 180 votes – nothing in a seat with over 12,000 votes for 'other'. What this map highlights, that the first does not, is that this seat could change – with an apparently massive swing – entirely because of preferences (see below). The moral of this post, then, is to never rely on only one method for analysing data. Sometimes the ubiquitous standard of margins does not tell the whole story. Obviously both maps have their advantages and disadvantages. The first is straight forward and easy to read, simplifying the entire concept (but I am sure it has some good points too...). Ignoring O'Connor, as noted above, it is easy to spot the most marginal seats (for example Corangamite, Denison and Macquarie, which stand out due to their size). These lighter-coloured seats can be hard to identify for one party-group or another so it is not immediately obvious, for example, that both major parties have three seats with margins under 1% and about half a dozen more under 2%. Beyond the spatial distribution of marginal and safe seats, this map really offers little that cannot be read from the raw data. The second map shows who the margin is against and where other parties rank, once you get your head around the colour coding. O'Connor is no longer as marginal as the initial map suggested, although there are other ways of fixing this for Map 1. The point is not to determine which map is better. Many professionals would say Map 1, and perhaps that is more useful in general . The point is that Map 1 is not the be-all-and-end-all of seat safety as determined by the previous distribution of votes. Multiple methodologies should be implemented as appropriate and in conjunction with each other. Seeing as I have been politely humoured so far, I should probably begin to justify my use of three colours throughout my posts. Having vocally disapproved of the two-party preferred mentality, it may superficially appear that I have simply shifted to an equally erroneous three-party approach. In practice, there are technical limitations to using more than three colours. In maps where more than one colour is used for an area – as in map two where green, red and blue overlap to varying degrees in each seat – it is problematic to use any other colours. Since red, green and blue are the primary colours for screen display s, every other colour can be made by combining these. Yellow, for example, could be used to represent a fourth party, but could also be the result of a red-green overlap. In Map 2 a marginal seat between the ALP and Greens would be indistinguishable from a safe yellow seat. The choice of ALP, Coalition and Greens not only works well with the three available colours, but as they are the only parties with seats in the lower house, they are the obvious and most practical choices. I have, nonetheless, attempted to consistently represent the impacts of other minor parties and independents as white or grey as necessitated by the methodology. At times these limitations lead to ambiguity, and I do not know how to resolve this. In Map 2, seats won by independents naturally have a large 'others' component, although this could equally be divided among a great many 'others'. Regardless, 'others' is not a practical indicator. A safe seat for a left-wing, retiring independent is unlikely to be won by 'others' if the only other 'others' are right-wing independents or minor parties. For both of these reasons it is probably best to treat these seats as having a lot of potential voters with unknown allegiances – potentially volatile, especially where the incumbent is retiring or, contrary to the implications of the colour scheme, is not an 'other'. This can occur because primary votes do not equate to actual seat wins. The Seat of Denison in Tasmania is a good example of this. Despite being held by an Independent, the Liberals had marginally more primary votes than the 'others' and the ALP had almost 9,000 votes more (which is equal to roughly 15% of the valid votes for that seat). In order to ensure every vote counts, there is a flow-on effect in our electoral system. In a seat with one right-wing party and five left-wing parties it is easy to see how a strong left-wing majority could be divided such that a right-wing party has the most votes. In our electoral system, the least-supported party is eliminated and the votes distributed by their second preference, so that in all probability a left-wing party will eventually triumph. This redistribution of votes in Denison was enough to give the incumbent a 1.2% margin over the ALP in the end. Thus a seat with a lot of 'other' votes could represent one strong candidate or many fragmented 'others' that have their votes redistributed among other parties. This also causes issues in the more traditional first map. These two-party preferred margins are grossly modified by the redistribution of preferences. Many people may follow the provided 'how to vote' pamphlets each election, which means margins of one party over another could be entirely reversed by a third party's deals that sees second- or third-hand preferences switch allegiance. Watson, our surprise magenta seat, is a case in point. Further more, some 'others' running last election may not run this time, and visa versa. Thousands of former 'others' votes could switch their final allegiance even if the political climate did not change one iota. Watson could change hands, with a swing of almost 10% or more, purely because a minor political party has disbanded. The two-party preferred margins suddenly don't look as solid as they had. Margins and swings are often used as the main (or even the only) model of how the nation stands before the election, and it is this that I object to. These issues I have mentioned above are not necessarily fatal to the pendulum models – margins are undoubtedly very useful – but should serve as a warning that other forms of analysis should be awarded equal consideration. Combined with trends, margins can offer a very good indication of each party's starting positions. With targeted polling, it is possible to extrapolate national trends and make decent predictions. But never rely on a single method – be it margins or anything else. As the seat of Watson illustrated, there is a lot more to consider than the simple continuum of the pendulum that you will no doubt see repeated often in the lead up to the election. And now that you have been forewarned of the common over-reliance on the pendulum, you can respond with a knowing smile. Next week we will hopefully look at the upcoming WA state elections upon the eve of the ballot. After that we may do some analysis of the results and what they might imply federally, or divert onto another topic. The conclave might even have concluded by then, so who knows what topic – or topics – might come out in a tangled Gordian Knot of words and maps.